Always. Bet no one’s told you that before. But it’s true. Understand this is not to say it is a smooth ride. It’s not. It is most often a wild and rocky road. But it always, and I mean always, goes up. Not each year. Not each month. Not each week and certainly not each day. But take a moment and look at any chart of the stock market over time. The trend is relentlessly, thru disaster after disaster, up. And, if you continue your periodic investing while the market is falling, you will reap exponential rewards when the market rebounds – as it always does. 1. Market crashes are to be expected. Everyone remembers 2008-2009. What happened in 2008 was not something unheard. It has happened before and and people panicked. The headlines of the day scared people senseless – they sold out. Click on the image to see a collage of panic newspapers! The great recession of 1974-75. The massive inflation of the late 1970s & early 1980. Raise your hand if you remember WIN buttons (Whip Inflation Now). Mortgage rates were pushing 20%. You could buy 10-year Treasuries paying 15%+. The now infamous 1979 Business Week cover: “The Death of Equities,” which, as it turned out, marked the coming of the greatest bull market of all time. The Crash of 1987. Biggest one day drop in history. Brokers were, literally, on the window ledges and more than a couple took the leap. The recession of the early ’90s. The Tech Crash of the late ’90s. And that little dust-up in 2008. 2. The market always recovers. Always. And, if someday it really doesn’t go up, no investment will be safe and none of this financial stuff will matter anyway. More Up (75 times) Than down (43) times. The gains of the up markets (14.73) more than doubled the losses of the down markets (-6.16). The number of consecutive positive years out numbers the number of consecutive negative years. It turns out that the market had only one time when it was down four years in a row. On the other hand, there are 7 times when it was up 4 or more years in a row. 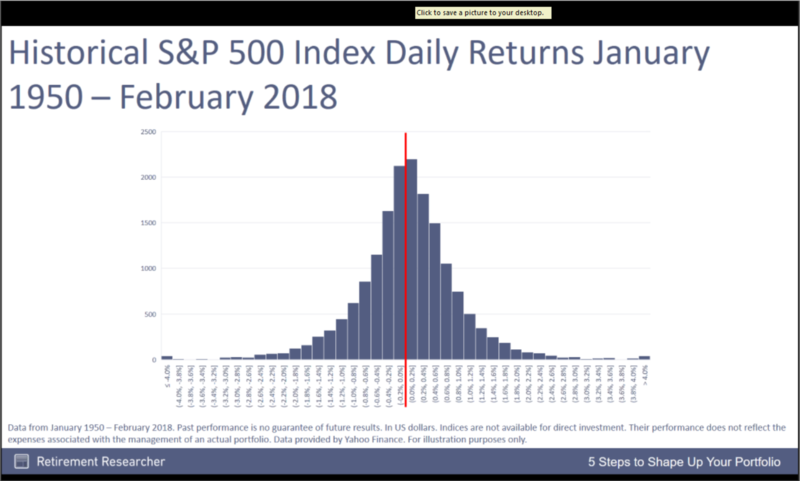 This chart shows how the large daily changes we are seeing are really pretty normal , but rate and nothing to be concerned about … in the long run. 4. The market is the single best performing investment class over time. Bar none. 5. The next 10, 20, 30, 40 years will have just as many collapses, recessions and disasters as in the past. It’s not possible to prevent them. No question, every time your investments will take a hit. Every time it will be scary as hell. Every time all the smart guys will be screaming: Sell!! And every time the guys with enough nerve will prosper. 6. This is why you have to toughen up and learn to ignore the noise, stay the course and ride out the storm. Oh, and Buy! 7. To do this, you need to know these bad things are coming. They will happen. They will hurt. But like blizzards in winter they should never be a surprise. And, unless you panic they won’t matter. 8. There’s a major market crash coming!! And there’ll be another after that!! What wonderful buying opportunities they’ll be. The above is the most compelling evidence that you must stay invested during market depressions and or recessions. The market has always come back. Baring Armagaden, it will continue to come back after and and all disasters. How likely is it that there will be another string of four down years in a row? Well, how many strings of four years are there in 116 years? There are 112 strings of four. Thus there is a 1 in 112 chance, less than 1%, that there will be another string of losses four years in a row. 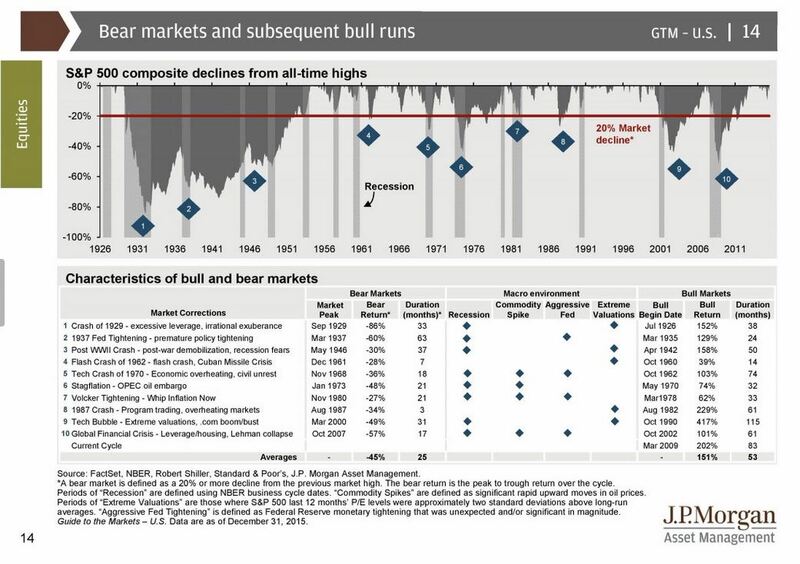 Note that the market recovered after every decline, especially the most memorable one in our lifetime, 2008-2009. Over the last 114 years, the sum of the up percentages exceeds the sum of the down percentages by 8.16! If the DOW is not up in the long run, nothing else will be doing well either and that would mean the the entire world economy was in shambles and all bets are off. Index Fund Advisors introduces a concept they call Rolling Periods. For a selected time period, 50 years in this case, they look at every instance of 50 years since Jan 1, 1928 through April 30, 2015. There are 449 Rolling 50 year periods in that time frame. The first one starts on Jan 1, 1928 and ends on Dec 31, 1978. The second rolling period starts on Feb 1, 1928 and ends on Jan 1, 1978, etc. 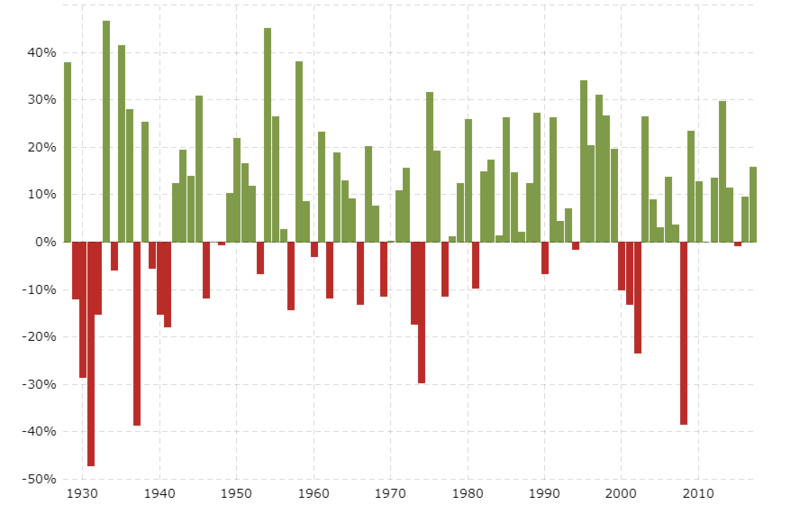 Here we will look at the 449 Fifty Year Rolling Periods from Jan 1, 1928 through April 30, 2015. Note again that this period includes the worst market period in history, the great depression, 1929 – 1933. Recall that “The Plan” requires at least 15 years of investing before retirement. Why? Because other than 2 periods during the Great Depression years, there has never been a 15 year period where an investor has lost money! This amazing fact is demonstrated at the excellent website of Index Fund Advisors. Click HERE to see that 99.77% of 859 monthly, rolling 15 year periods produced positive results. Note: they use the S&P as their investment index fund. Since the Dow has outperformed S&P over the long run, their results will hold for the VTI too. 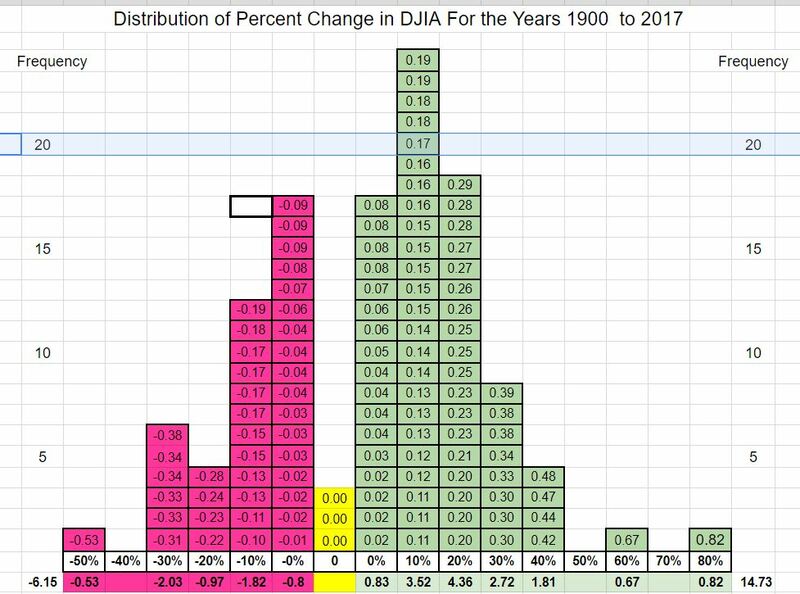 Lowest Return:-0.34% 12/28-11/43 (1928 is first year of Great Depression! The investor who starts at age 35 and invests for 30 years will in all likelihood have a considerable sized portfolio at the time of retirement. Clicking on THIS LINK will demonstrate that anyone investing $100 a week at age 50 and withdrawing AT LEAST $100 a week or more (up to 5% per year) starting at age 65 would STILL have thousands left at age 90 (again with the exception of those years impacted by the great depression). A 17th-century engraving depicting the Amsterdam Stock Exchange built by Hendrick de Keyser (c. 1612). The Amsterdam Stock Exchange was the world’s first official (formal) stock exchange when it began trading the VOC’s freely transferable securities, including bonds and shares of stock. In the early 1600s the Dutch East India Company (VOC) became the first company in history to issue bonds and shares of stock to the general public. The Dutch East India Company (founded in the year of 1602) was also the first joint-stock company to get a fixed capital stock and as a result, continuous trade in company stock occurred on the Amsterdam Exchange. Soon thereafter, a lively trade in various derivatives, among which options and repos, emerged on the Amsterdam market. Dutch traders also pioneered short selling – a practice which was banned by the Dutch authorities as early as 1610. The market goes up, the market goes down. Grass is green. In the long run, the market is UP, two to one. History is on your side …. so long as you have 15 or more years to be invested. Note the precipitous decline during the “Great Depression” (381 down to 41). The great depression of 1929 – 1933 was a catastrophic event for those who were counting on their stock portfolios for retirement. The market had huge losses (-17%, -34%, -52%, -23%) four years in a row. No wonder people were jumping out of windows to their death. Since then, however, the market has grown by 3570%! Every retirement plan, defined benefit pension plan, IRA, 401K, annuity, insurance plan, etc. is based on the fundamental assumption that the stock market will continue an upward trend. The IFR plan requires that you will invest in the stock market. To avoid the stock market out of fear is to put your financial future in jeopardy. The quote is from an article by that appears in USA Today, 10/24/2013. You can read the entire article by clicking HERE. Here is a quote from Warren Buffett. * Much of the data I report in this website was learned from an excellent online advisor firm, Index Fund Advisors. They maintain that a diversified portfolio is superior to what I propose and they make a good case. If you do as they say, you will do OK. But it’s harder to do and they charge a fee of .9%; which, BTW, is very low.